After years of steady growth, the number of U.S. adults taking nutritional supplements has begun to rise, reaching 76% in 2017. 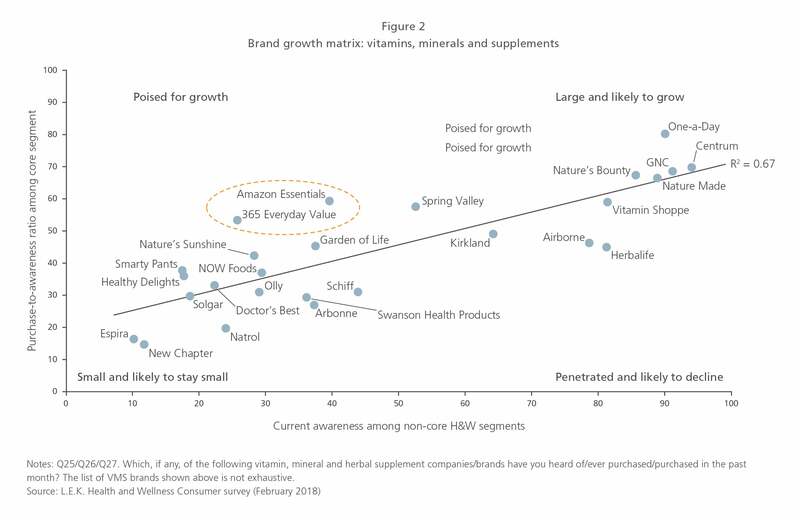 While nutritional supplements appear to be an attractive category with room for growth, they have been subject to the same seismic shifts as the broader retail market. Although there are bound to be winners and losers over the next several years, industry players still have time to act and to shape successful outcomes. Consumer interest in maintaining a healthy lifestyle has remained strong over the past decade, buoying retail categories that focus on health and fitness. This includes nutritional supplements, which have enjoyed steady 6% growth since 2005 in the U.S.1 The future also looks bright. After years at the same level, the number of U.S. adults taking supplements has begun to rise, reaching 76% in 2017 according to a recent study by the Council for Responsible Nutrition. While nutritional supplements appear to be an attractive category with room for growth, they have been subject to the same seismic shifts as the broader retail market. Specifically, the rising importance of all things digital is placing pressure on some players while simultaneously paving the way for others. Four trends in particular are reshaping the nutritionals landscape. 1. Pressure on the specialty retail channel. For years the specialty retail channel for nutritionals has been dominated by two key players: GNC and The Vitamin Shoppe. Both are under significant pressure. Their stock prices have declined more than 90% from their five-year peaks, and while sales may appear to be holding up, top-line stability has been driven by more store openings rather than by same-store sales. In fact, the latter have been dropping steadily for the majority for the past several years. Both GNC and The Vitamin Shoppe have undertaken strategic initiatives to reposition their businesses and avoid the fate that many specialty retailers — from Borders to RadioShack — have suffered over the past decade. In December 2015, The Vitamin Shoppe launched a reinvention initiative designed in part to improve the shopping experience, including a revamped mobile app and loyalty program, new hiring and training practices, and stores equipped with tablets and Wi-Fi. A year later, GNC rolled out a similar initiative. More importantly for GNC, it recently received a $300 million investment from Chinese pharmaceutical company Harbin Pharma that will help support its turnaround efforts. While the jury is still out, effecting a turnaround amid intensifying competition remains a steep challenge for these companies. 2. Ascent of Amazon/Whole Foods. Even a rumor that Amazon is preparing to enter a particular market or category is enough to strike fear into the hearts of industry incumbents. With its acquisition of Whole Foods in 2017, Amazon moved into the brick-and-mortar natural grocery space with a vengeance. There are a host of ways analysts expect Amazon to combine its own and Whole Foods’ assets and capabilities — from implementing two-hour Prime Now delivery to upgrading in-store technology to lowering Whole Foods’ famously high prices. These strategies all have the potential to draw traffic away from other stores. Furthermore, both Amazon and Whole Foods have strong positions in the nutritionals space. Whole Foods has long devoted significant shelf space to vitamins and nutritional supplements and has been a leading retailer in the segment. For its part, in February 2017, Amazon added private label supplements (Amazon Elements) and has quickly expanded this offering. Amazon’s move into the supplements market is expected to further increase competition and has the potential to compress margins across the industry. In fact, Amazon Elements had the second-highest Net Promoter Score (NPS) of approximately 25 vertical marketing system (VMS) brands tested in L.E.K. Consulting’s 2018 Health & Wellness (H&W) survey — an impressive score of 61%. Furthermore, in L.E.K.’s 2018 H&W study, Amazon has, on a self-reported basis, captured approximately 30% of the nutritional supplement spending of H&W consumers. 3. Resurgence of the food, drug, mass merchant and warehouse club (FDMC) channel. As more consumers embrace nutritionals as an important aspect of their life-styles, leading traditional FDMC retailers are devoting a greater amount of shelf space to these products. Between 2012 and 2016, Walmart and Costco increased their number of stores by an estimated 18% and 15%, respectively, which effectively increases the amount of shelf space devoted to VMS in the marketplace. This trend is even stronger among natural grocery stores like Whole Foods (nearly a 35% increase) and Sprouts (more than a 70% increase). This places even more pressure on specialty players, since many consumers can find the products they need at a store where they already shop — a top reason consumers cited in L.E.K.’s 2018 H&W study (after “lowest price”) for choosing a particular channel for buying nutritional supplements. 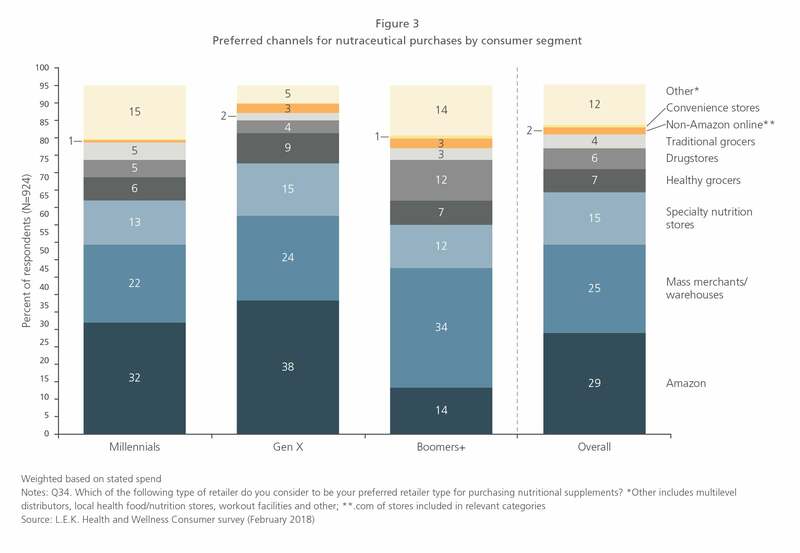 Furthermore, even nutritional supplement consumers who shop at specialty stores spend more on supplements in FDMC channels. Convenience is a strong factor here, but so is price, which is generally lower in FDMC channels, especially for their private label supplement brands. And the one advantage of specialty purveyors — product range and selection — is narrowing rapidly as FDMC retailers add more variety to their offerings. 4. Emergence of direct-to-consumer nutrition brands. One final trend that is transforming the nutritionals space is the emergence of a spate of direct-to-consumer (DTC) startup companies that bypass brick-and-mortar retail stores altogether. These players offer a range of solutions, many of them anchored in personalization. For example, Ritual, founded in 2015, offers a single nine-ingredient multivitamin for women on a subscription basis. Vitagene, founded in 2014, is a personalized subscription service for vitamins and supplements. It designs a personalized regimen for each customer based on the individual’s DNA, lifestyle and bloodwork. A relative newcomer to the space, Vitaminpacks, also offers a subscription service, but uses a technology platform to analyze scientific studies, medication interactions and customer surveys, generating a personalized supplement package for each customer. These players seek to differentiate themselves from the “sea of sameness” that plagues many vitamin and nutritional brands. Using stylish packaging, education, customer engagement and a personalized customer experience, these companies have the potential to capture a select group of consumers willing to pay premium prices for superior products. As with any industry upheaval, there are bound to be winners and losers in the nutritionals sector over the next several years. However, the key players still have time to act and to shape successful outcomes. 1. Specialty retailers. These retailers (e.g., GNC, The Vitamin Shoppe) face the most risk, given both their price and convenience disadvantages compared with the Amazon and FDMC channels. In order to survive as retail channels, they will need to reassert their authority in the category through service, consultation, curation and more holistic wellness solutions, including such services as nutrition and fitness consultation. Streamlining their store footprint to better match their core health and wellness customer will also help strengthen their position. The specialty retailers also have an asset in their private label nutritional supplement products, which represent brands in their own right. 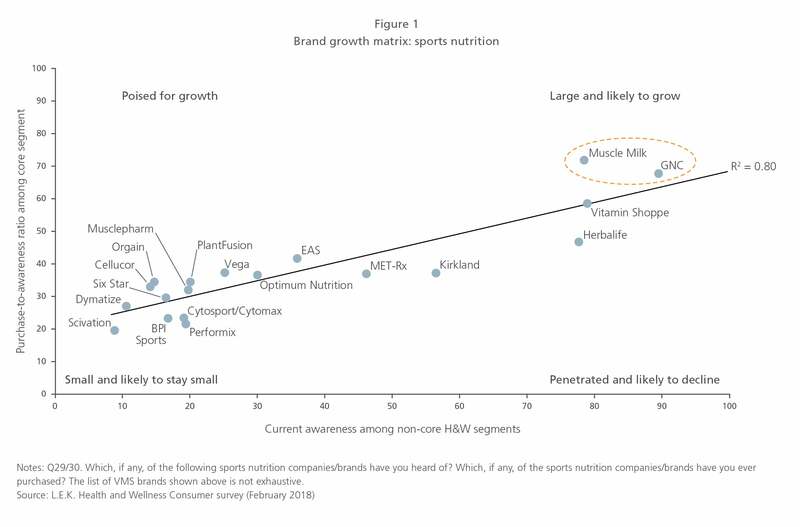 For example, in the sports nutrition category, GNC has the highest awareness of the approximately 20 sports nutrition brands tested and appears positioned for further growth, according to our proprietary brand growth matrix (see Figure 1) from our 2018 H&W Consumer survey. 2. FDMC retailers that have not made nutritionals a core focus. These retailers will also find themselves at a disadvantage when competing with more progressive FDMC retailers like Walmart and Kroger that have invested in technologies designed to boost sales of nutritionals. Those who want to improve their position in the category will need to look for ways to differentiate themselves beyond price and “buy one, get one free” offers. These might include more advice, providing mobile shopping tools to support consumers while shopping and convenient replenishment options. 3. Amazon. Not surprisingly, Amazon, with its purchase of Whole Foods, is poised for big wins in this category given its focus on convenience and its relative price competitiveness. In fact, our brand growth matrix for VMS (see Figure 2) suggests that both Amazon Elements and the Amazon/Whole Foods-owned 365 Everyday Value brand are both among the VMS brands poised for continued growth. 4. DTC companies. These companies also have a shot at gaining market share if they pursue the right strategy. In particular, they have an opportunity to leverage the current challenges facing specialty retailers to take ownership of consultative selling in the nutrition category. Sports nutrition products may well present an attractive opening for DTC sellers, as these are likely to disproportionately suffer from a decline in the specialty nutrition channel and have low incumbent brand strength to begin with. 5. Online channels. For brands in the nutritionals space and for investors looking to identify winning players, online/digital capabilities are critical to success and will only continue to grow in importance. Online is the top nutritional supplement channel for millennials and a close second for Gen X consumers (see Figure 3). In particular, those brands that are adept at online marketing and customer acquisition will be most likely to enjoy a healthy bottom line in a sector that has become increasingly competitive. 1Source: Wedbush Securities analysis of Nutrition Business Journal.